Selected Science News: HOW TO READ BRAIN ACTIVITY? The electroencephalogram (EEG) has been widely used in research and medicine for more than 80 years. The ability to measure the electrical activity in the brain by means of electrodes on the head is a handy tool to study brain function as it is noninvasive and easy to apply. 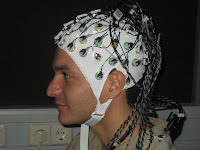 The interpretation of the EEG signal remains, however, difficult. The main reason for this is that the exact relationship between the activity generated in the brain compared to that measured on the scalp is unclear. Therefore, a question of paramount practical importance is how EEG can be used to deduce neural activity in the brain. Recently, Kevin Whittingstall and Nikos Logothetis from the Max Planck Institute for Biological Cybernetics in Tubingen have addressed this very question for the first time. By combining recordings of both EEG and individual neurons in trained monkeys, Whittingstall and Logothetis found that a combination of specific waves in the EEG could indeed reliably predict the activity of cells in the brain. They presented different movie clips consisting of everyday natural scenes to trained monkeys. While the monkeys watched, their brain activity was recorded via EEG and via electrodes that were placed directly on the neurons, thus allowing for a direct comparison between data sets. Specifically, they observed that the firing pattern of cells was highest during periods where bursts of ‘fast’ EEG activity were embedded within the slow-wave EEG. As the degree of this so-called ‘frequency band coupling’ changed, so also did the cells firing rate.